Aerospace, advanced manufacturing, computer engineering, power engineering and communication systems – you name the industry, and electrical engineers have a place in it. The BS in Electrical Engineering prepares you for a rewarding career in design, research, testing, development and manufacturing of electronic systems and equipment. – Select “WSU Everett” as your campus and “Elect Eng” as your academic interest. * NOTE: The WSU tuition deposit, which confirms acceptance of your WSU admission offer, is nonrefundable; pay the deposit only after you are accepted/certified into the electrical engineering program. 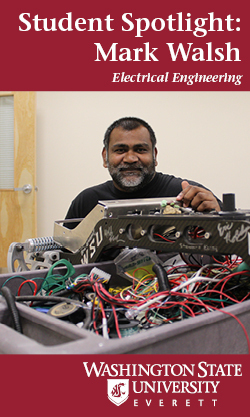 There are scholarships available for WSU Everett electrical engineering students. No application is necessary for these departmental scholarships. If you are offered a spot in the program, eligibility for these scholarships will be determined based on transfer GPA in the major related courses. Students will be notified of their scholarship awards and conditions to receive the award. Electrical engineers work in many different industries doing circuit design, research, development, manufacturing and testing. They work with components and systems that include electric motors, radar, navigation systems, communication systems, power generation equipment, and electronic equipment. There are more than 160,000 electrical engineers in the United States and their median annual income is about $87,000. To learn more about the profession, visit the Institute of Electrical and Electronics Engineers at ieee.org.